a. 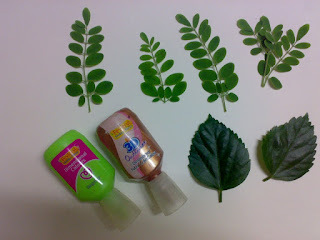 Use leaves that have prominent veins behind them. 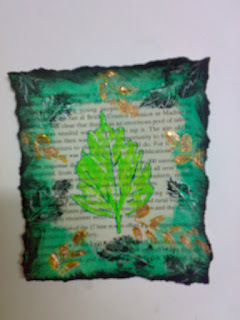 The main leaf I used here is hibiscus leaf. b. 3D outliners from FEVICRYL or equivalent. Here I took a sheet from an old novel and tore from all 4 sides. 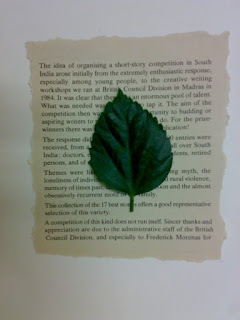 Place the leaf to get an idea about where it should be. 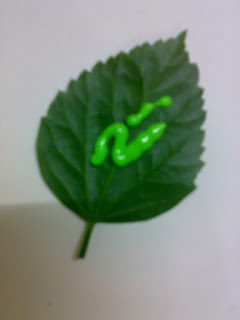 Spread the 3d outline all over the leaf evenly .Made sure all the edges are covered. Applied it to its stem too. 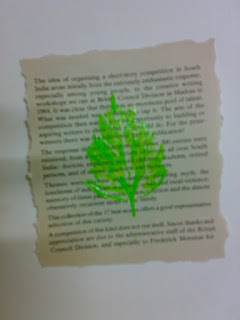 Now took the leaf and placed it on the paper. Dabbed over it evenly covering the whole leaf. Removed the leaf slowly. This was how it look. Note: The image would never come fully. It looks great however it comes though. 5 Sponged dark green color around the image. 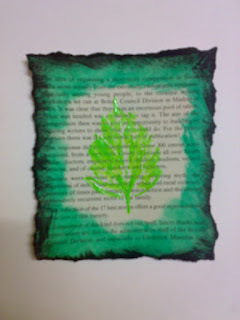 7 Used the same method and stamped with the other leaf shown above. 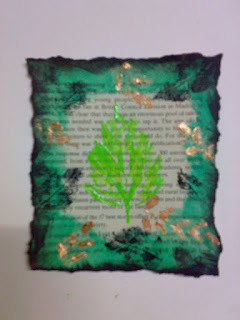 8 Took another hibiscus leaf and stamped it in black. Here I have used water colors. They are very easy to work with. 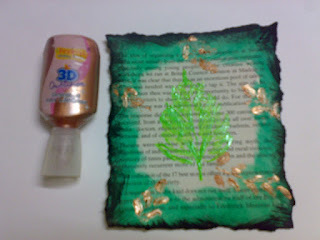 Applied it on the leaf with sponge. 9 Highlighted the stamped images with glitter pens . 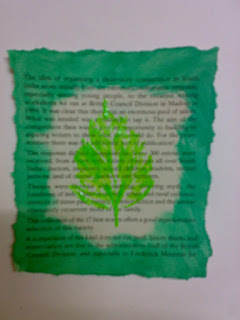 Did the veins of the main leaf with a green marker. 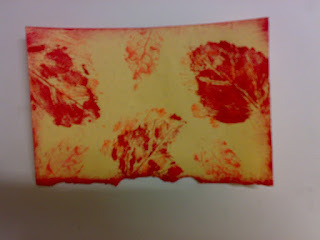 Took a yellow cardstock and stamped in orange(first) and red with a hibiscus leaf here. 11 Assembled everything together. 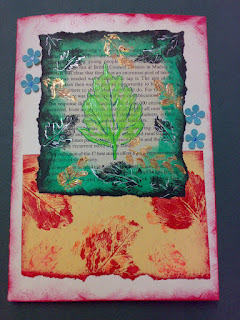 Added the punched flowers and sponged the edges red. Thanks for viewing… hope you liked it! I brayered and sponged the night sky.. drew the bushes and glued gems to it. 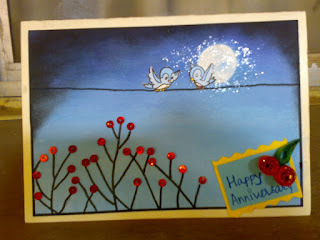 Added the cut out of the birds.Spread some silver glitter around the moon. Roses n the leaf are quilled. I am really happy to start a blog of my own.. This is a great feeling.. This is something I was looking for .. a detailed place from my stuff... Great! Looking forward to your visits and encouragement.